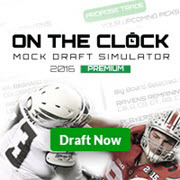 Drafttek.com's Big Board of 2018's top NFL draft prospects is compiled by our internal staff of talent evaluators. The NFL draft prospect rankings are adjusted regularly during the NCAA Football season. The Big Board also undergoes an adjustment process during post-season All-Star games, the NFL Combine workouts, and individual campus workouts. Click HERE for explanation of our terminology.